Former England striker Gary Lineker has described Argentina football legend Diego Maradona as a laughing stock for his excessive goal celebrations during the 2-1 win over Nigeria on Tuesday night. 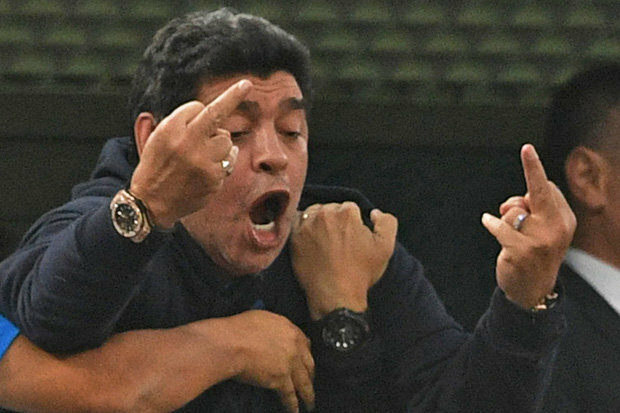 1986 World Cup winner Maradona was seen celebrating Argentina goals excessively during the crucial Russia 2018 World Cup Group D victory at the Saint Petersburg Stadium in St. Petersburg. BBC Sport presenter Lineker was highly critical of Maradona in his post-match analysis after the Argentina-Nigeria game. Former Manchester United defender Rio Ferdinand, who was one of the football pundits with Lineker on BBC Sport added: “His career as a football player on the pitch was up there with the best. “But unfortunately there are moments like this that do arrive. It is not nice to see that.” He concluded. Argentina needed a win against Nigeria to secure a last 16 spot at the World Cup tournament in Russia and that was exactly what they achieved with goals from star man Lionel Messi and Marcos Rojo. Victor Moses had scored form the spot on 51 minutes to cancel out Messi’s opener bit Manchester United defender Rojo struck late to take Argentina through to the knockout stage.